This vegan chai spice loaf cake is the perfect sweet treat. It’s soft and tender, full of masala chai flavor, easy to make, and so delicious! My favorite way to enjoy this is (obviously) with a cup of steamy, milky chai. A thick slice of cake, a hot cup of tea, a cozy blanket, and your pick of a good book or your favorite Netflix show complete the scene. It’s such a good cake, and hard to stop at just one slice! 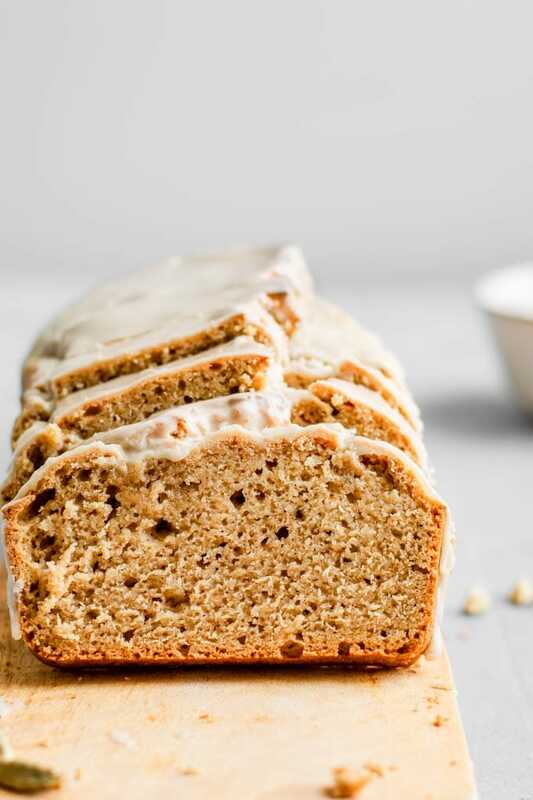 Loaf cakes are some of the easiest cakes to make. The recipes tend to not be fussy, and the final presentation rests on the simplest of glazes. Despite the rustic bake and finish, this cake is sure to delight! 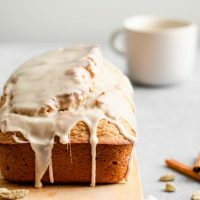 It’s a perfect combination of sweet and spiced, highlighting my favorite chai spices as well as the black tea. 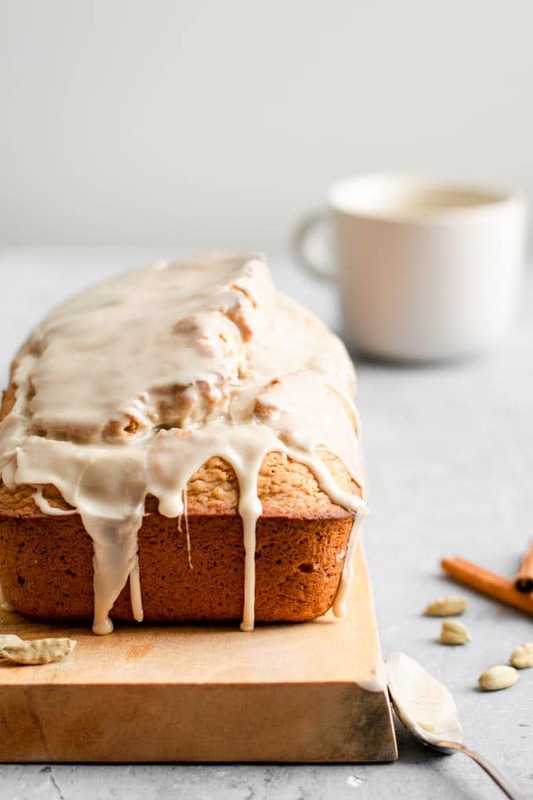 This cake gets double dose of chai spice, with the plant milk steeped in masala chai and the spices cinnamon, ginger, cardamom, cloves, and black pepper stirred into the dry mix. 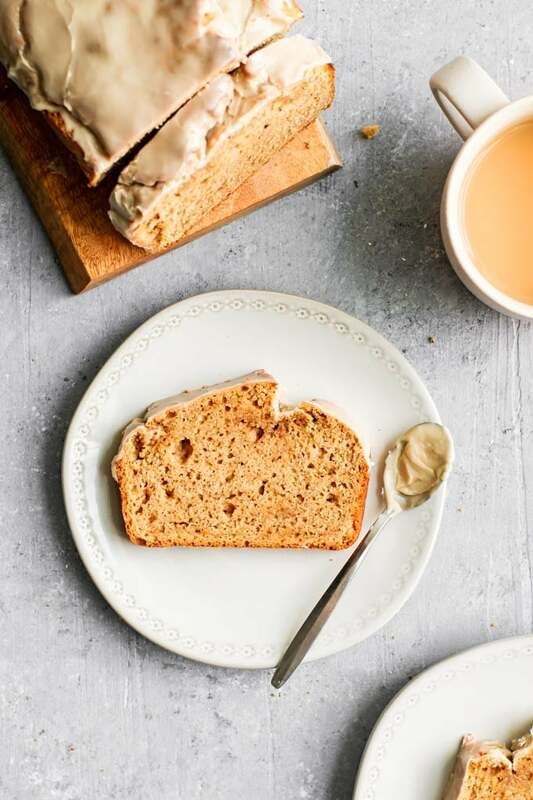 Black pepper may seem like an odd choice for a sweet cake, but it is one of the ingredients in masala chai and you won’t want to miss it! This cake is super easy to make. Start by steeping the masala chai in the plant milk of your choice. 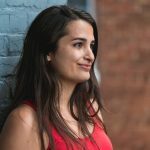 I typically buy soy or oat milk, but any should work in this recipe! Bring it to a simmer on the stove, then add the tea and let it steep for 5 minutes before straining. Add the remaining wet ingredients: a neutral flavored oil such as canola or safflower, plant based yogurt, and vanilla extract. 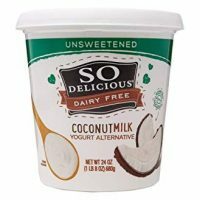 For the yogurt, I prefer to use a thick plain and unsweetened nondairy yogurt such as coconut yogurt. If you can’t find good vegan yogurt near you, substitute sour cream or silken tofu that’s been blended with a bit of non dairy milk to make a thick yogurt consistency. Next, whisk together the dry ingredients. When it comes to measuring your flour for my recipes, first whisk the flour in the bag or container it’s stored in. Using a big wire whisk to refluff the flour undoes any settling that varies from day to day, bag to bag, person to person. Then, scoop the flour with a measuring cup and level using the back of a butter knife. This extra step of whisking helps keep the measurement equal between my kitchen and yours and from bake to bake. 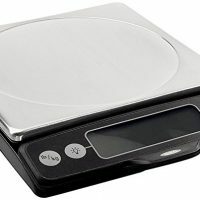 Even better though is to forgo the volume measurements and use a kitchen scale to bake! Along with the flour, add the sugar, cornstarch (which helps keep the bread nice and tender and moist), baking powder and baking soda, salt, and the spices. 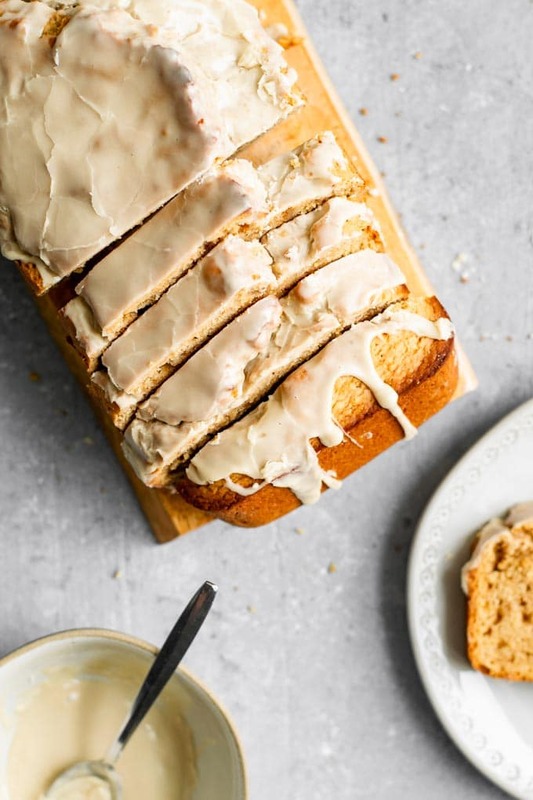 The spices used for this cake are those commonly found in masala chai. Cinnamon, ginger, cardamom, clove, and black pepper. Whisk these dry ingredients together until combined and fluffy, then pour in the wet ingredients. Stir the wet and try together with a wooden spoon until you have a fairly smooth batter. Careful to not over mix your batter, as this makes cakes gummy and keeps it from rising as high. 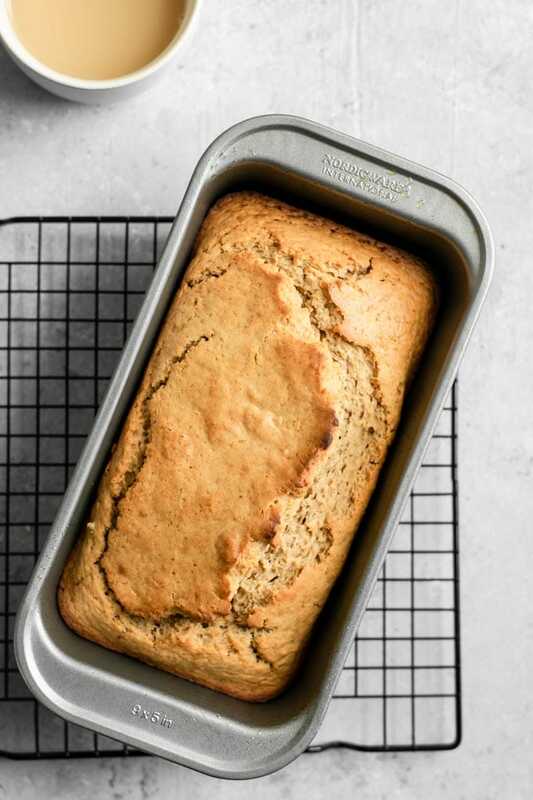 Transfer the batter to a greased loaf pan, and bake in a preheated oven until done! Let the cake cool in the pan for 10 minutes, then remove and cool completely to the touch on a wire rack before glazing. The glaze is an easy 2-ingredient recipe. Sift your powdered sugar, this keeps it from having any hard lumps in your glaze, and is especially important for ‘natural foods’ or organic powdered sugar. Then add a couple tablespoons of masala chai steeped plant milk. Whisk these together to get a thick glaze. Pour it over your cake and let it drip off the edges a bit. Do this on a wire rack over a baking tray or piece of parchment paper so clean up is easy. As the glaze sits it will crust over at the top. This is because of the corn starch that is added to powdered sugar to keep it from caking. Now some organic powdered sugar brands do not contain any starch, if this is the case, consider adding a couple teaspoons of corn starch to the powdered sugar so that the glaze will crust. And that’s it! Slice up your cake and enjoy with (or without) that cup of tea! 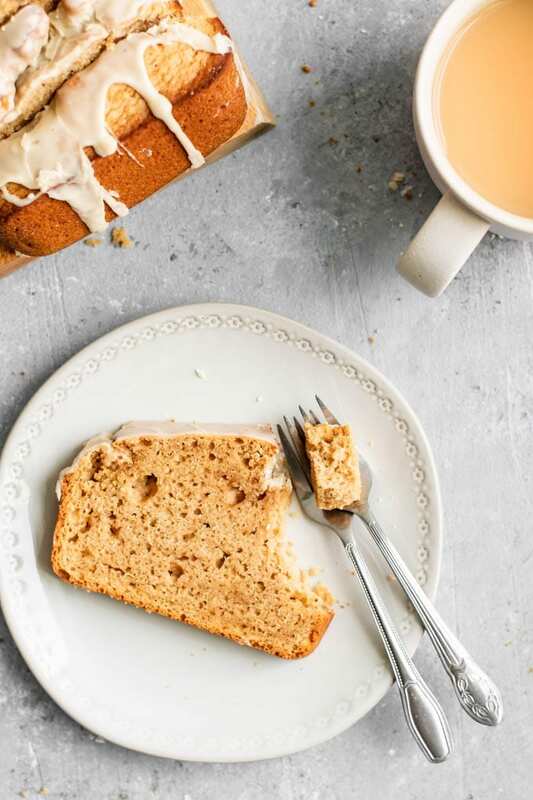 If you make this chai spice cake, leave a comment below and rate the recipe on the recipe card. And please share your photos with me on Instagram, tag @thecuriouschickpea and #thecuriouschickpea. I love seeing your recreations! 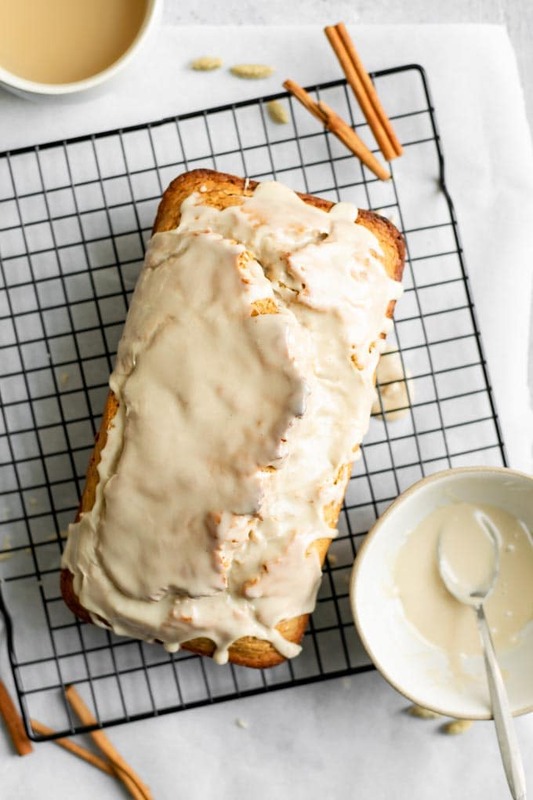 This spiced chai cake is glazed with a masala chai icing. It's soft, mouthwatering, easy to make, and the perfect sweet treat! Preheat the oven to 350 ºF and grease a loaf pan (approximately 9" x 5") by lightly spraying with oil. Bring the plant milk to a low boil on the stove. Add the masala chai tea and steep for 5 minutes, then strain. In a small mixing bowl stir to combine 1 1/4 cup (300g) of the prepared masala chai milk along with the oil, yogurt, and vanilla extract. Reserve the remaining chai for the glaze. In a large mixing bowl whisk together the flour, sugar, cornstarch, baking powder, baking soda, salt, ginger, cinnamon, cardamom, clove, and black pepper to combine. Once the oven has preheated, add the wet ingredients to the dry and stir with a wooden spoon to make a thick batter, taking care to not over mix. Pour the batter into the prepared loaf pan and bake for 50-60 minutes, or until a tester comes out of the center clean or with a few crumbs. Let the cake cool for 10 minutes in the pan, then remove it and cool completely on a wire rack. 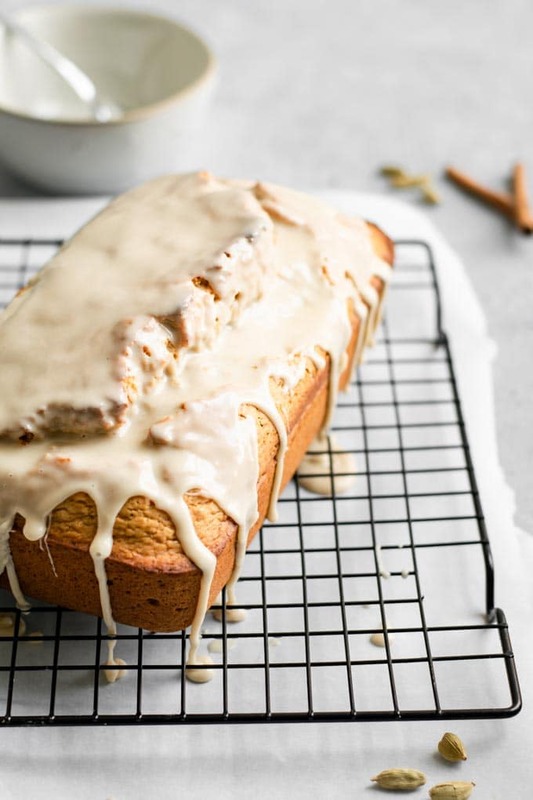 Make the glaze: sift the powdered sugar into a mixing bowl, add 2 tbsp of the chai steeped plant milk and mix to make a thick but pourable glaze. When the cake has cooled, pour the glaze overtop to cover. *We make extra chai because there's always some loss of liquid when bringing to a boil and then steeping the tea. You can dilute any extra chai with hot water to drink, or use it in place of milk in your tea. *If you can't find vegan yogurt substitute vegan sour cream or blended silken tofu. Plain (sweetened) vegan yogurt is ok too. 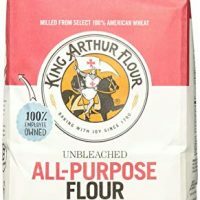 *To measure flour properly for my recipes, whisk it to undo any settling, then scoop and level with the back of a knife.